I don't pay attention to high fashion as much as I wish I did. 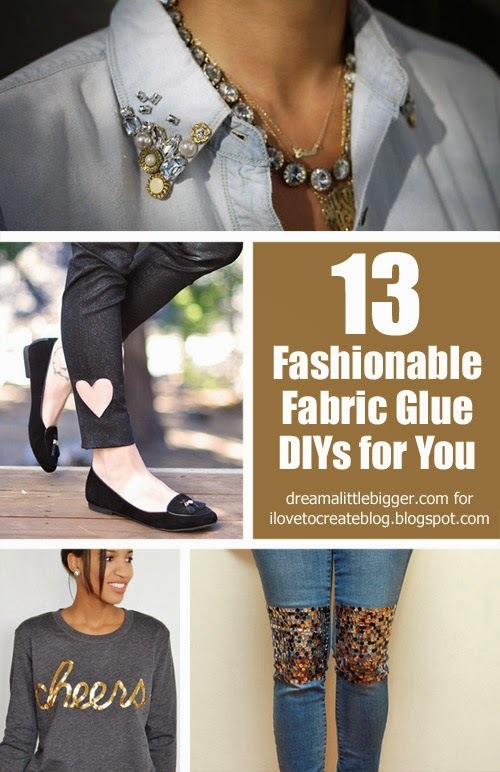 There used to be a time when I kept my eyes peeled to see what killer new looks I could DIY myself. But luckily these fab bloggers do pay attention to the world of fashion and have some great tutorials showing you how to keep your wardrobe in the know on the cheap. It's amazing how sometimes the most simple additions can turn a tee shirt from blah into amazingly fabulous. 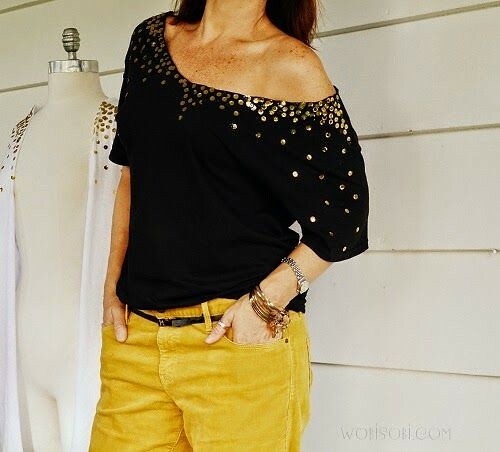 Take this tee embellished with some fab feather shoulder pads... To be honest, I'm not sure just how washable feathers are, but with a bit of velcro they can easily be removed prior to washing! I love chambray shirts so much. Adding just a bit of embellishment just at the tips of the collar dresses up this casual classic so much. I love how Erica at Honestly WTF doesn't overdo it. 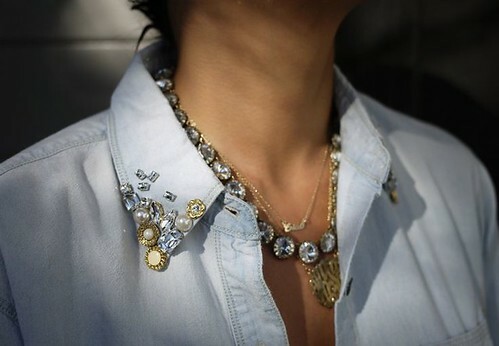 This shirt paired with some carefully selected necklaces and the look is blingy but not ridiculously so. Even with me not paying too much attention to the fashionable world, even I saw that Holy Chic tee that was selling for over $200 at Asos. I'm sorry, but that is ridiculous. I mean, Macklemore thought $50 was ridiculous for a tee shirt and he was right! Luckily you can DIY up your own at Ballou's Cues. I was under the impression that every lady loved lace. But I have been informed that is not always the case which surprises me. I LOVE lace. And little lace accents here or there? They can totally turn something plain into something amazing. I guess that's why I love this tee from Completely Unfinished. It's simple and has lace on it. Boom. Win. So this is hardly the first tutorial for making words on your shirts with sequins... BUT I think the results are so smashing it is most definitely worth a feature. What do you think? Does that fab sweatshirt from Spark and Chemistry look DIY? I didn't think so! 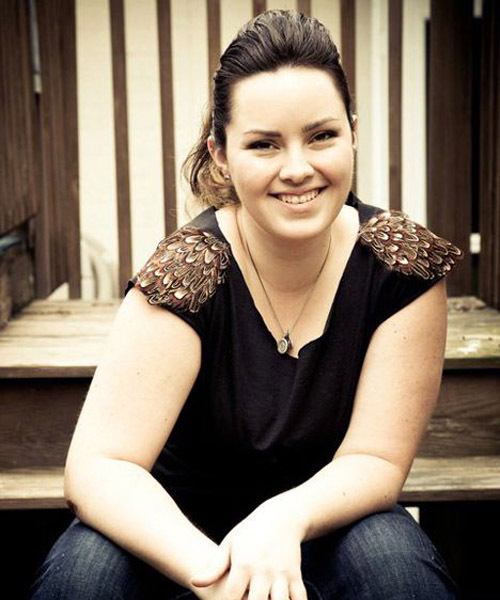 It's no question that our very own Ann of Wobi Sobi is the queen of tee shirt refashions. I mean, she can take a plain tee and turn it into a million different things in a million different ways. And she's all about glitter and sequins which makes her perfect in a whole 'nother way. You know how you find perfectly soft tees on clearance but a lot of times they are in humongous sizes you can't wear? Wilma took an overly large tee shirt and turned into a much fancier looking top. So grab those baggy clearance tees and your fabric glue and get ready to get after it! Pearls are another totally girly thing I love. 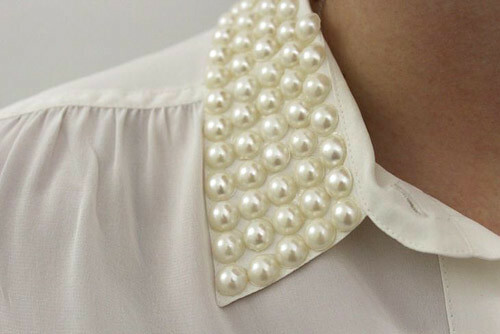 If you ask me, pearls can make just about anything classier. And this pearl bedecked collar by Grace at Stripes and Sequins? Ah-mazing. Flat out. Okay, now this tee shirt reconstruction from EcoHeidi at Cool2Craft is technically meant as a kid's craft. But look at that? Can you see the possibilities? 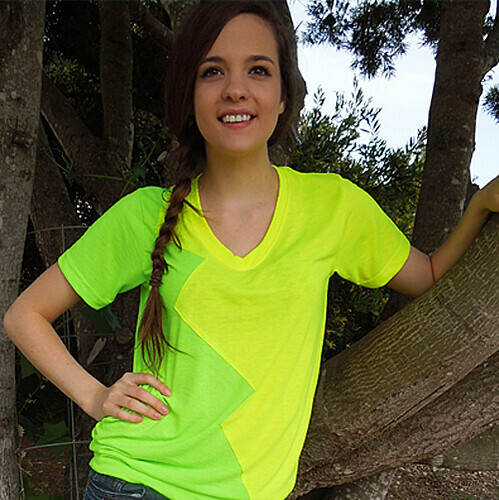 There's an awesome video to show you how to take two shirts and turn them into one with the power of scissors and fabric glue. Awesome! Real fur I'm not exactly cool with but faux fur I'm all over because it's plush and soft and wonderful. 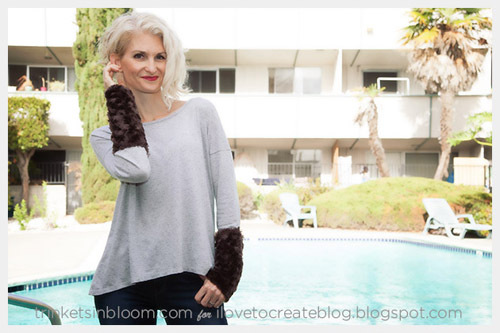 When I saw this fab faux fur cuffed refashion from Cathy from Trinkets in Bloom here at iLoveToCreate, I instantly started mentally going through my shirts to see which I could do this to! Over at Eat. Sleep. Denim. 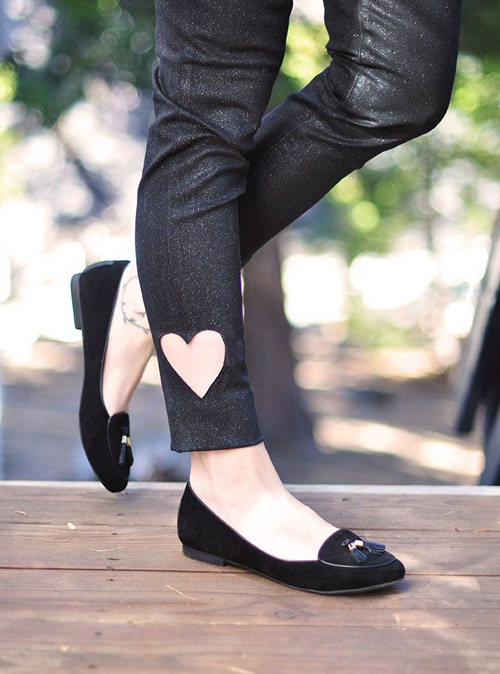 a pair of fab jeans by Tommy Ton for style.com were seen and artfully recreated with the power of fabric glue and sequins! I love how possible it is to imitate high fashion at budget prices with just a little bit of effort. Thankfully Christina was able to see the DIY possibility! 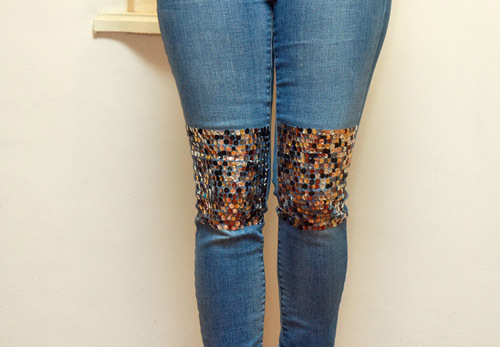 Denim DIY: Sequin Knee Pads - Eat. Sleep. Denim. Have you met Mayhem of Fashion by Mayhem? I've been following her on Instagram for some time. 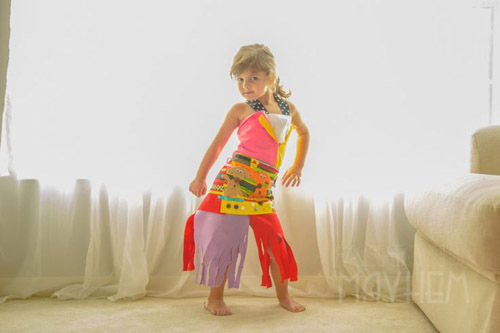 This sweet little gal makes her own clothes out of paper and now felt and fabric glue! I love how her momma is so supportive even taking little Miss Mayhems fashion shots in front of the same sun shining window. If you've not met this little sweetie, you simply must. Love what I love? Check out some fab tutorials on my site Dream a Little Bigger! 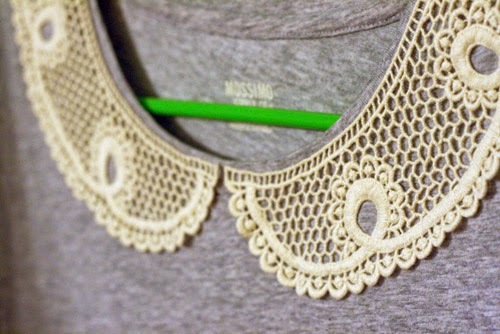 DIY Lace Collar Tee - it's very nice and eco-friendly! Thsnks for your ideas!